Congratulations to our 44th President on his Inauguration! To celebrate the start of a new presidency, among the diverse sounds of the city today, pause a moment to listen for the Bells ringing an Inaugural peal (5000 changes) at Trinity Church. It should be glorious! Trinity's Bell Tower contains 12 bells, the most of any church in the country. 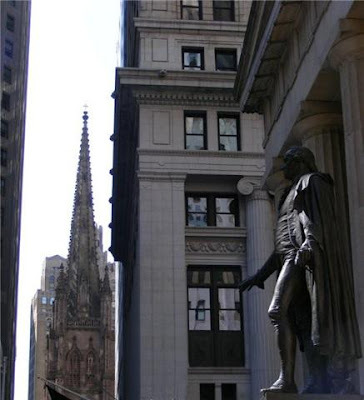 Founded in 1697 with a charter from King William III of England, the Gothic Revival Church at Wall Street stands steps away from Federal Hall, where our first President took the oath of office 220 years ago in 1789. The Master Ringer reports, that the bells, pulled by human hands (in the tradition of great European Cathedrals), will peal for more than 3 hours! So, if you cannot be in Washinton DC, tear yourself away from the TV, listen for the bells of Trinity, or better yet, take a train downtown to Wall Street and stand before the bronze statue of George Washington on this historic day. Thank you Mary Radcliffe for sharing this story with us. Address to Remember: Trinity Church, Broadway and Wall Street, New York, NY 10006, 212-602-0800, http://www.trinitywallstreet.org/. Directions: From Times Square MTA 2 or 3 to Wall St., walk west to Church.